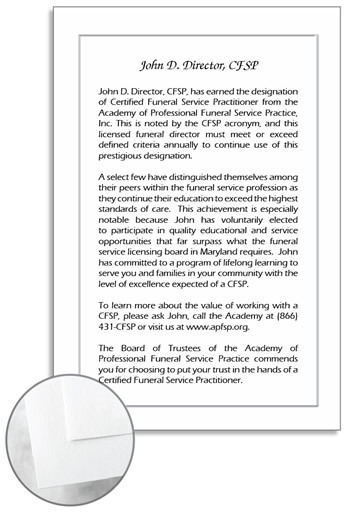 High-quality, personalized card promoting your CFSP designation! We have designed a professional, high-quality, personalized card describing what it means to be a CFSP. We hope you will use this valuable tool to share your accomplishment with the families you serve by placing the CFSP Family Folder Card in each family folder to promote the value of your CFSP designation. If you have more than one CFSP in your firm, you can include all the names for one order for better pricing. U.S. shipping and handling is included in price. We are required to charge Ohio Sales Tax of 6.75% on the total of each order. Please call for a quote for orders of more than 500 cards.